Former President Donald Ramotar yesterday released a letter written by prominent businessman Brian Tiwarie pledging his support to the PPP a month before the May, 2015 general elections that ended the party’s 23-year reign. A blazing row has erupted between the two men on a range of matters and Ramotar’s release of the letter was meant to show that Tiwarie had not told the truth in a letter in yesterday’s edition of Stabroek News, where he said he had withdrawn his support for the PPP a year before last year’s general elections. The feud, which has since enmeshed Ramotar’s brother and ignited debate over the management of the ill-fated specialty hospital project, will be seen as a commentary on how prominent businesses may shift political allegiances after a change of government. “This man BK (Tiwarie) is something else I tell you…that release he sent yesterday is just total lies and pulls in my brother, but my brother can stand up to scrutiny anywhere, anytime, so I am not worried,” Ramotar told Stabroek News yesterday. “He (Tiwarie) is now a big supporter of APNU and said he switched sides over a year ago. 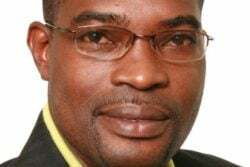 Yet, I have a letter that he sent shortly before the elections, where he said his support for the opposition (then APNU+AFC) was a lie and so on,” Ramotar added. Ramotar, yesterday afternoon released the letter, dated March 23rd, 2015, which Tiwarie sent him. “I am completely disheartened by your recent charges, made both publicly and privately, that I am a supporter of Brigadier David Granger and his opposition alliance. I am indeed further affected by your charges that I have sought to aid the opposition by sharing with them some documents in my possession,” Tiwarie wrote to then President Ramotar. “Mr. President, nothing could be further from the truth. Please note sir I have always been a longstanding supporter of the PPP from long before 1992,” the letter further stated. Efforts by Stabroek News yesterday to contact Tiwarie for comment on the release of the letter proved futile. 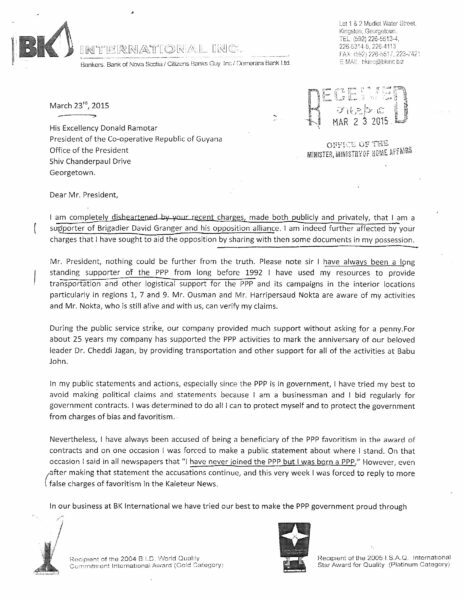 In his letter, Tiwarie pointed out that he used his resources to help aid the PPP’s elections campaigns and named logistical support and transportation to regions 1, 7 and 9 as where he helped out. According to him, other PPP executives could attest to his claims. “For 25 years my company has supported the PPP activities to mark the anniversary of our beloved leader Dr Cheddi Jagan by providing transportation and other support for all of the activities at Babu John,” Tiwarie asserted in the correspondence. The Chief Executive Officer of BK Inc also pointed out that while he has made many friends due to the nature of his work and travels around the country, this does not mean that he is politically connected to those persons. He pointed out that he has never publicly endorsed any political party as he wanted to protect himself and the government from charges of bias and favouritism. In his missive to Ramotar, Tiwarie also said that anyone who reports that he was providing support to another political party because they may have seen him “someplace” was being malicious and wicked and then president must be wary of their mischievous aim to cause division. “As you would have said yourself, this is an extremely important election where the PPP is seeking to restore its lost majority, no one should be allowed to distract us. I will continue to serve in any way I can in the circumstances before us,” he stated, before wishing Ramotar and the PPP the best in the 2015 General and Regional Elections. Ramotar told Stabroek News that he released the letter to show that Tiwarie cannot be trusted. 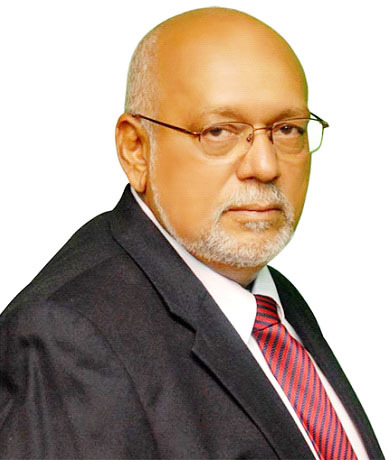 He said that he read in yesterday’s edition of Stabroek News, a letter to the editor, where Tiwarie blasted his administration over the specialty hospital contract and took direct jabs at his brother Peter Ramotar. “How my brother got pulled into this? Look, my brother is not the type to get into a public back and forth but I am satisfied that he is above board and can stand any scrutiny,” Ramotar said. Tiwarie had blasted former President Ramotar for stating that Tiwarie’s company BK Inc. had taken possession of eight Surendra Engineering Company Limited containers valued at $800M. Tiwarie said that the containers held steel rods to the value of US$153,000 ($32m) and were sold at public auction held by the courts. 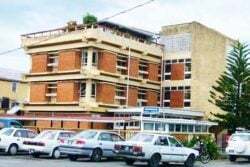 BK had sued Surendra for $400m pertaining to foundation work that had been done on the Specialty Hospital site. Tiwarie charged that the Managing Director (MD) of Surendra was prevented by a court order from leaving Guyana, pending the honouring of the judgment granted to BK but that the Ramotar administration, on the advice of his Attorney General, Anil Nandlall allowed the MD to leave. Tiwarie’s salvo at Ramotar was in response to a report in Thursday’s edition of Stabroek News reporting the former President as querying why the current administration had allowed BK to take possession of the containers to the detriment of the former PPP/C government’s $950m claim against Surendra. Sources, who are privy to the sale, told Stabroek News that the key barge in question was built in 2014 by Nurse Shipbuilders, of Parika, for the Maritime Administration Department who in turn sold it in November to Peter Ramotar. It worked from then on for Peter Ramotar, on government-funded contracts. Peter Ramotar has served as a regional executive officer during this period. 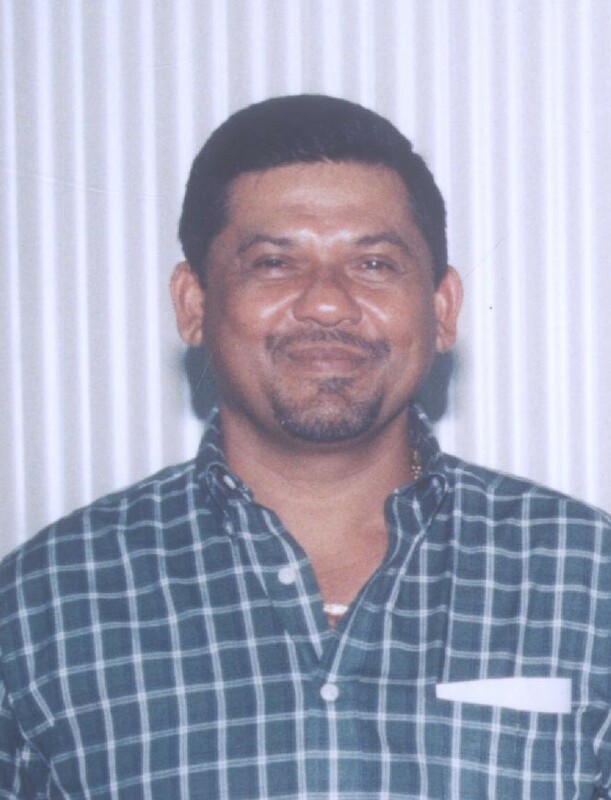 Sources close to Tiwarie have told Stabroek News that the businessman lost confidence in the PPP after Ramotar was nominated as presidential candidate in 2011. When he won the presidency, the sources say that Tiwarie was vocal in PPP circles that he did not believe that Ramotar was the person to lead the nation. In his letter to the editor, Tiwarie had defended his change to supporting the coalition in 2014, saying that from a patriotic vantage point he believed that was the change needed and he was not the first. “For those like former President Ramotar and others who want to convey the impression that BK only jumped ship after the new Government was formed in May 2015, I want to make it abundantly clear that like every patriotic person in Guyana, I took a conscious decision to support the move for change and this decision was made one year before the 2015 elections. There are numerous persons who can support this,” he stated. Tiwarie was one of those businessmen who attended the inauguration of President David Granger at Public Buildings and immediately assisted with clearing up the area around the Brickdam Arch. Tiwarie was controversially appointed as an advisor to Minister of State Joseph Harmon. This appointment was immediately rescinded by Granger while Harmon and Tiwarie were on a trip to China. Their being photographed in China with representatives of Chinese logging company Baishanlin raised a barrage of questions, many of which remain unanswered. Tiwarie and Harmon share an over four-decades -old friendship that Tiwarie has said he won’t apologise for, while pointing out that it transcends politics and is one he values dearly. “Joe is my friend and everyone knows he is my friend…that (friendship) was formed before politics and he is one of the few men I trust the most. I have no apologies for that. Now, that you can write because it is a known…,” Tiwari had told Stabroek News recently. Tiwari had copied his letter to Ramotar to former President Bharrat Jagdeo; then Head of the Presidential Secretariat, Dr Roger Luncheon; then Minister of Home Affairs Clement Rohee and then Minister of Tourism, Irfaan Ali.